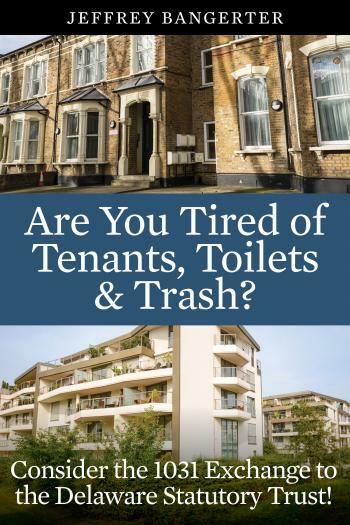 Home > Are You Tired of Tenants, Toilets & Trash? Are you ready to retire from Landlording? We work our whole lives so we can travel and enjoy our retirement. However, the reality is with tenants comes additional responsibilities that you must deal with either directly or hire others that will take care of issues for you. If you chose to sell your property outright then the taxes could be outrageous and most of use are not willing to give that gift to the government. A 1031 Tax Deferred Exchange to a Delaware Statutory Trust (DST) securitized real estate project where you have a fractional interest in a large real estate project may be the answer you have been looking for. With the DST you are a passive owner with no Landlord duties, in fact you no responsibilities at all. You have no financial responsibility to any debt that may be place on the property and you do not pay any property taxes as long as you stay in the DST programs. You owe it to yourself to investigate the DST option for your 1031 Exchange and finally really retire from the Landlording Business.